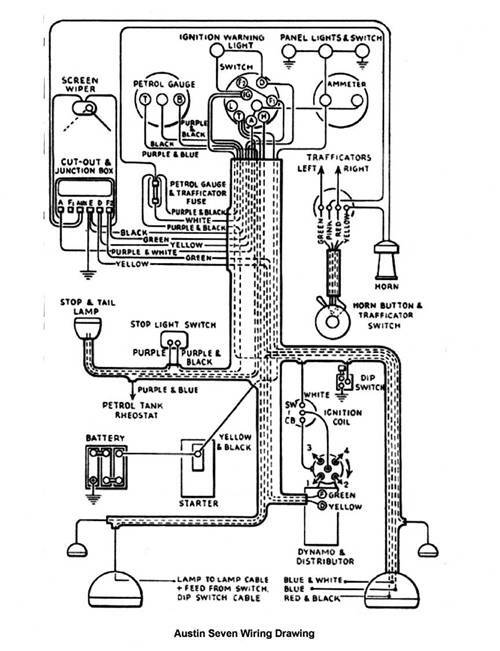 The Austin Seven Ruby circuit diagram must be the most complex of all the 'Sevens'. 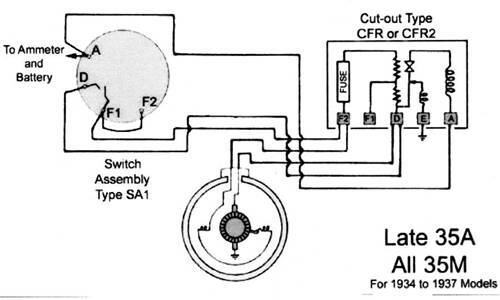 The diagram shows the complete car electrics. Don't despair, look at the second diagram, where all the circuits except for the charge circuit have been deleted. The next thing is to explain the function of each component in the circuit. The battery stores and releases electrical energy as and when required. How it works is complicated and would be the subject of another article and not required for our story. The dynamo driven by the engine will pump electrical energy into the battery and it will supply electricity to the other circuits. The cut-out only allows the dynamo to be connected to the battery when it is generating electricity. In the back of the box are a few resistors that also control the charge rate that the dynamo puts out. The ignition/control switch is a busy fellow and does lots of little jobs. Consider the charge circuit and see how it works. First the ignition light. When the centre ignition switch is turned on the ignition light comes on. Lets follow its small circuit. It is connected to battery negative via the switch, ammeter and back to battery. The other wire from the lamp is connected to the "D" contact on the switch, if we follow this back, it is connected back to the cut out "D" connection and then down to the dynamo, the circuit is then through the dynamo to the earth brush. Hence as the dynamo is not producing an output the light comes on. Once the dynamo produces sufficient voltage to close the cut-out contacts, the ammeter is connected directly to the D terminal via the closed contacts. Now the bulb is shorted out and so it goes out. Thus if the engine is running and the ignition lamp remains on it's a good bet that either the dynamo is not charging or the cut-out is faulty. Usually, it will be the dynamo that is at fault. The Dynamo - how does it generate electricity? Inside the dynamo are two static permanent magnets placed opposite each other. One is the North Pole and the other the South Pole. Between the poles a magnetic field exists and around the magnets the field windings are wound and interconnected. Sitting in the magnetic field is the armature. This consist of a bundle of copper wires coupled in a special way at one end and brought out to the commutator at the other end. The function of the commutator is to allow carbon brushes to collect the generated electric current. There are two brushes that fulfil this function; at the bottom the earth brush and the top is the brush connected to the "D" terminal to transfer the electrical energy to the battery. There is also a thinner brush fitted between the two main brushes and connected to one end of the field circuit, and becomes the negative end of the field system. The other end of the field system is connected to the "F" terminal on the case of the dynamo adjacent to the "D" terminal. Generation - as the armature of the dynamo is turned within the magnetic field, an electric current is induced in each copper conductor and collected by the carbon brushes. Once the dynamo voltage exceeds the battery voltage the cut-out coil closes the main contact and battery charging commences. The dynamo current must not be excessive and this is controlled by the third brush coupled with resistors positioned in the rear of the cut out. Depending on its position between the 2 main brushes, the third brush distorts the main flux path between the 2 field magnets. All we need to remember is the brush position is adjustable and if the brush is moved in the direction of the machines rotation the output is increased and moving it the other way decreases the output. Note that this has nothing at all to do with the dynamo VOLTAGE. Without any load, the voltage on the dynamo will vary from only a few volts at tick-over to as much as 20V when revved hard. What actually determines the voltage in the car is just the battery. That is why you can use an unmodified “6V” dynamo to charge a 12V battery. As we’ve already seen, once the dynamo is producing enough electricity to close the cut out, it must have the same voltage as the battery simply because it is connected directly to it. Once the dynamo is generating an electric current, some of this energy has to be used in the field windings to enhance the magnetic field. This in turn increases the output current of the machine. To recap the dynamo CURRENT is varied by the third brush position. The output current is set at full output or half output by the Lighting/ignition switch and the resistors in the base of the cut-out box. When the switch is set to summer charge because the F wire is not connected to D in the switch. It is connected to D by the two resistors in the cut- out. Reducing the field current and the machines output in all other switch positions F is connected to D with no resistance giving dynamo full output. Testing the dynamo - The quickest way to check the dynamo is with a test lamp. Disconnect both wires, the D and the F. Now connect a test lamp between the battery, (such as at the top of the starter motor) and each of the D and F terminals in turn. If the windings and the brushes are okay, then at each place the test lamp will light. Voltage testing - The cheap digital test meters will not measure battery volts when the engine is running. This is due to interference from the ignition system. Using an analogue meter such as an AVO, connect the D and F terminals together, and measure the voltage between them and earth. At tick-over this voltage may be very low. Now rev the engine - the voltage should swing up to more than 15V. This article, written by Ian Leaver, originally appeared in CA7C Seven Focus in Dec 2009, pp 23-25.